Last year, I spent the better part of my first semester at Tech throwing my hands up in the air as Paul Johnson and his football army proceeded to lose games in new, innovative ways each successive week. This year, I might have to settle for complaining about the athletic department and fans instead. When the Vanderbilt Commodores came to town, Tech announced that the game would be a “gold-out.” On some levels, this made sense. September is Childhood Cancer Awareness month, gold is the color of its ribbon and a portion of proceeds were going to the American Cancer Society, courtesy of AJC.com. 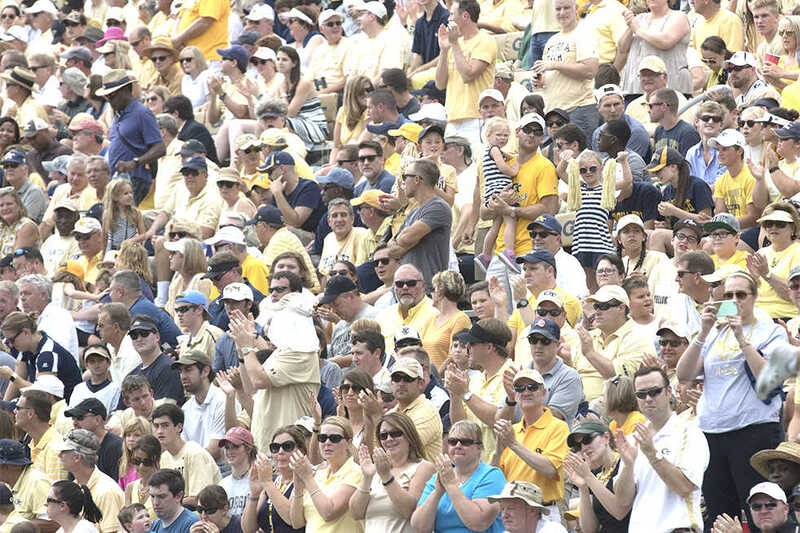 But it is apparent that at some point in the conception of this idea, the Georgia Tech athletic department either failed to consider the major drawback of its plan or did not care about it. That drawback, of course, is that Vanderbilt doesn’t fear gold. It’s one of their two primary colors. Their 2011 institutional slogan? “It’s good to be gold.” The name of their SB Nation website? Anchor Of Gold. Their outreach program for high school students? Black and Gold Days. And when the Commodores took the field against Tech, they were wearing — you guessed it — their gold uniforms. The point of a gold-out — or an any-color-out, for that matter — is to show solidarity as a team and fanbase, and intimidate the opponents. Wearing gold against Vanderbilt is the equivalent of deciding to punish a lactose-intolerant enemy by depriving him of milk. What’s next? Will we wear blue against Georgia Southern to bring awareness to ocean pollution? Perhaps an orange and green combination when we play Miami, to celebrate the United States’ continued friendship with India? There is no doubt in my mind that Childhood Cancer Awareness Month is a worthy cause. Every dollar of game profits that went towards the American Cancer Society was one well allocated. But the Jackets had their choice of three September home games — Mercer, Vanderbilt and Clemson — and they made the only possible wrong choice. There have been other head-scratching moments in my time here, from music over the stadium PA dueling with the Tech marching band to the Ramblin’ Reck rolling out at the same moment as the opponent, provoking an odd mixture of boos and cheers. But I can brush most of these off as understandable coordination issues. Assigning a gold-out against a gold-donning team? Inexcusable. Responsibility for school spirit doesn’t end with the athletic department, though. It extends to fans. If I had a nickel for every classmate who told me he wasn’t attending a Tech football game because he “wasn’t a football person” or “didn’t see the point,” I’d have enough money to buy them all luxury box seats for the rest of the season. I know that is incredibly hyperbolic and probably doesn’t make sense, seeing that a luxury box seat costs more than a nickel, but bear with me. College football games in the South aren’t just contests between two teams to determine athletic superiority. They are spectacles, imbued in tradition, nostalgia, and pride. And even if the first and second aspects mean nothing to you, the third ought to. Despite the love we profess for Tech, it hardly reflects in the empty stands on Saturday. And don’t try and tell me that we have to pick between being an academic institute and a passionate one. Visit Durham, where the Cameron Crazies feverishly support Duke basketball, or Palo Alto, where Stanford students put aside rigorous academics for a few hours on Saturdays to cheer on the Cardinal. Want to multitask? You’re at Georgia Tech. You can do that. If you are a diehard football fan, then congratulations. You get a cheap front-row seat to watch an exciting football team do battle for six or seven weeks each year. If you aren’t, tag along with friends (or make some at the game! ), shout when the rest of the crowd does, bob up and down to the Budweiser Song and generally enjoy yourself. The great thing about a college degree is that once you earn it, it’s yours for life. The professional experiences it gets you and the lessons you learn are invaluable. But the experiences you have at Tech, from meeting your first roommate to lazy Saturday afternoons wandering Buford Highway in search of authentic El Salvadorian food, will define you more than your resume ever will. And maybe one of those memories will involve Tech football, cheering on the Jackets as they fight for your Institute.